These fabulous earrings feature two emerald shape ruby gemstones. They are surrounded by sparking simulated diamond stones, as well as a disc of simulated diamond stones at the top. Earrings dangle down two inches and are about 3/4 inch wide. Earrings are in 14 karat yellow gold over sterling silver and have comfortable and secure post with friction backs. The pave disc stud portion is 10mm in diameter. 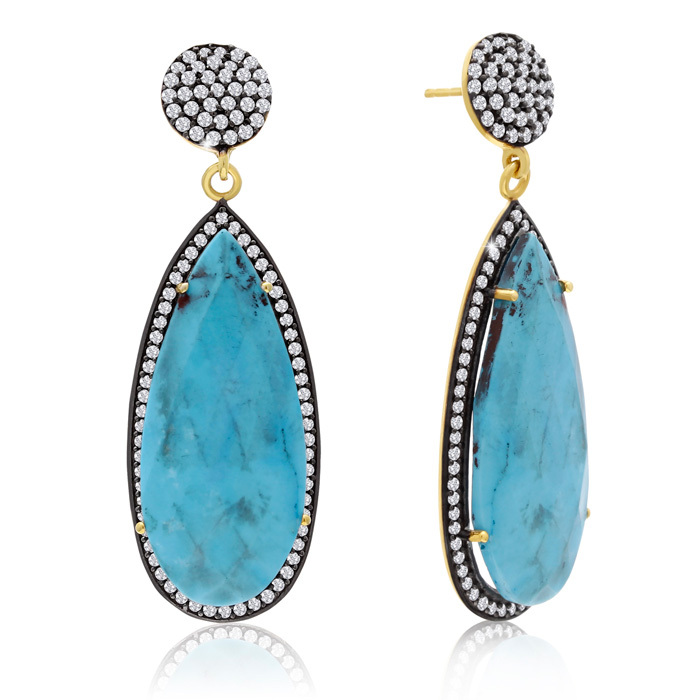 These fabulous earrings feature two pear shape turquoise gemstones. They are surrounded by sparking simulated diamond stones, as well as a disc of simulated diamond stones at the top. Earrings dangle down two inches and are about 3/4 inch wide. Earrings are in 14 karat yellow gold over sterling silver and have comfortable and secure post with friction backs. The pave disc stud portion is 10mm in diameter. 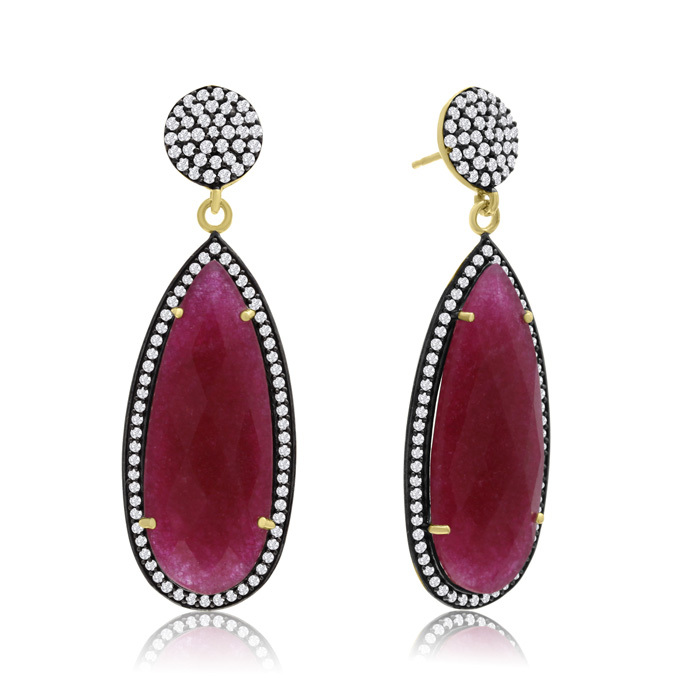 These fabulous earrings feature two pear shape ruby gemstones. They are surrounded by sparking simulated diamond stones, as well as a disc of simulated diamond stones at the top. Earrings dangle down two inches and are about 3/4 inch wide. Earrings are in 14 karat yellow gold over sterling silver and have comfortable and secure post with friction backs. The pave disc stud portion is 10mm in diameter. 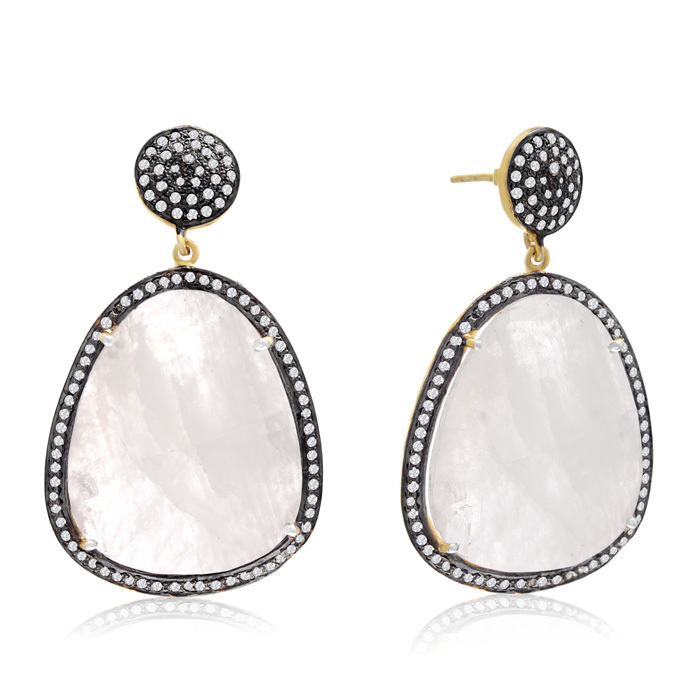 These fabulous earrings feature two pear shape moonstone gemstones. They are surrounded by sparking simulated diamond stones, as well as a disc of simulated diamond stones at the top. Earrings dangle down two inches and are about 3/4 inch wide. Earrings are in 14 karat yellow gold over sterling silver and have comfortable and secure post with friction backs. The pave disc stud portion is 10mm in diameter. 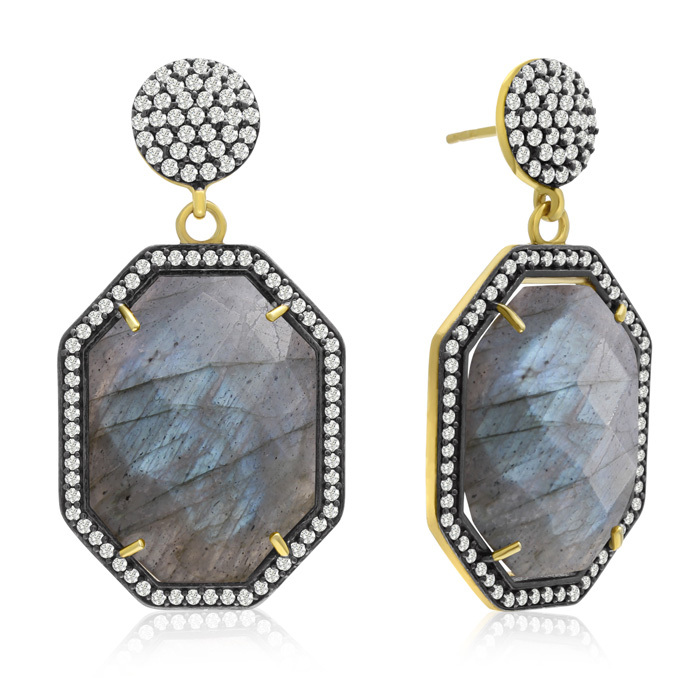 These fabulous earrings feature two octagon shape labradorite gemstones. They are surrounded by sparking simulated diamond stones, as well as a disc of simulated diamond stones at the top. Earrings dangle down 1 1/2 inches and are about 3/4 inch wide. Earrings are in 14 karat yellow gold over sterling silver and have comfortable and secure post with friction backs. The pave disc stud portion is 10mm in diameter. 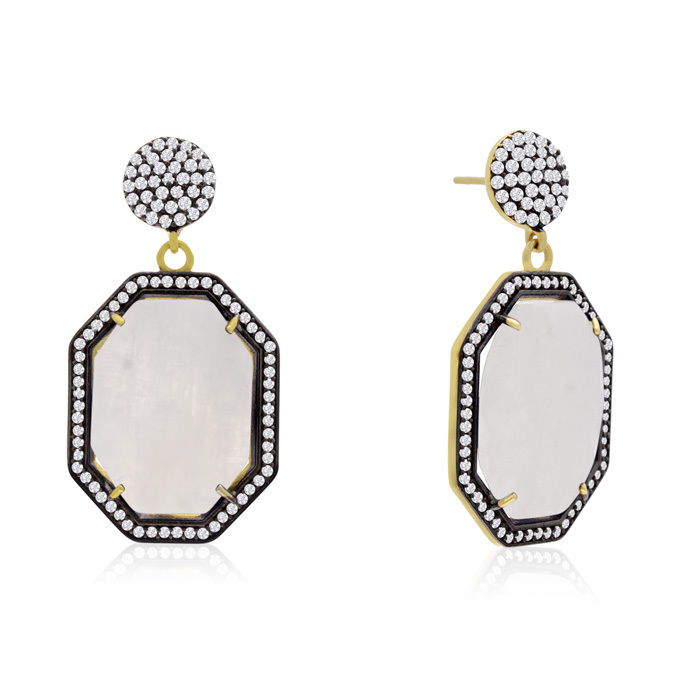 These fabulous earrings feature two octagon shape moonstone gemstones. They are surrounded by sparking simulated diamond stones, as well as a disc of simulated diamond stones at the top. Earrings dangle down 1 1/2 inches and are about 3/4 inch wide. Earrings are in 14 karat yellow gold over sterling silver and have comfortable and secure post with friction backs. The pave disc stud portion is 10mm in diameter. 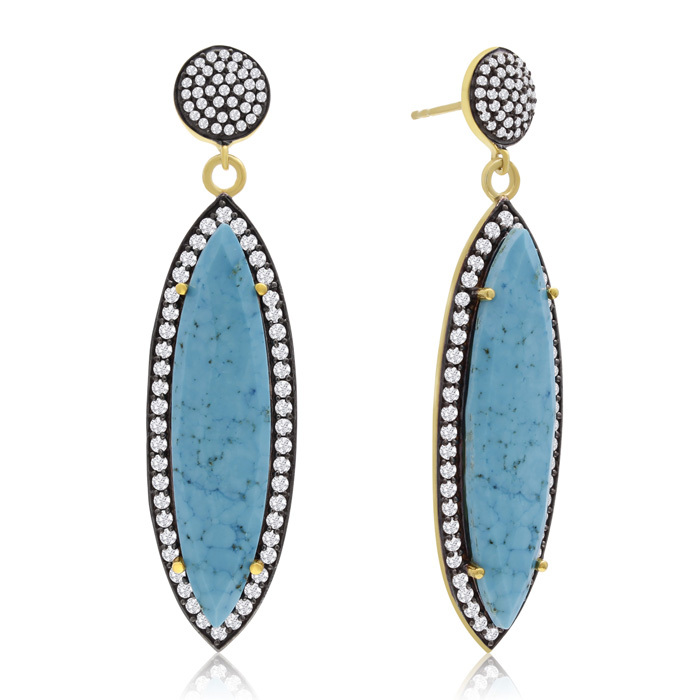 These fabulous earrings feature two marquise shape turquoise gemstones. They are surrounded by sparking simulated diamond stones, as well as a disc of simulated diamond stones at the top. Earrings dangle down two inches and are about 1/2 inch wide. Earrings are in 14 karat yellow gold over sterling silver and have comfortable and secure post with friction backs. The pave disc stud portion is 10mm in diameter. 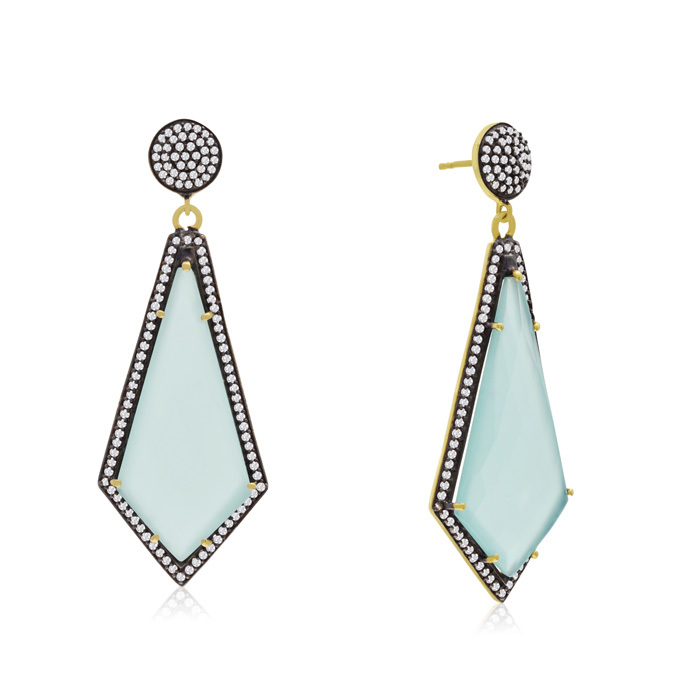 These fabulous earrings feature two emerald shape turquoise gemstones. They are surrounded by sparking simulated diamond stones, as well as a disc of simulated diamond stones at the top. Earrings dangle down two inches and are about 3/4 inch wide. Earrings are in 14 karat yellow gold over sterling silver and have comfortable and secure post with friction backs. The pave disc stud portion is 10mm in diameter. 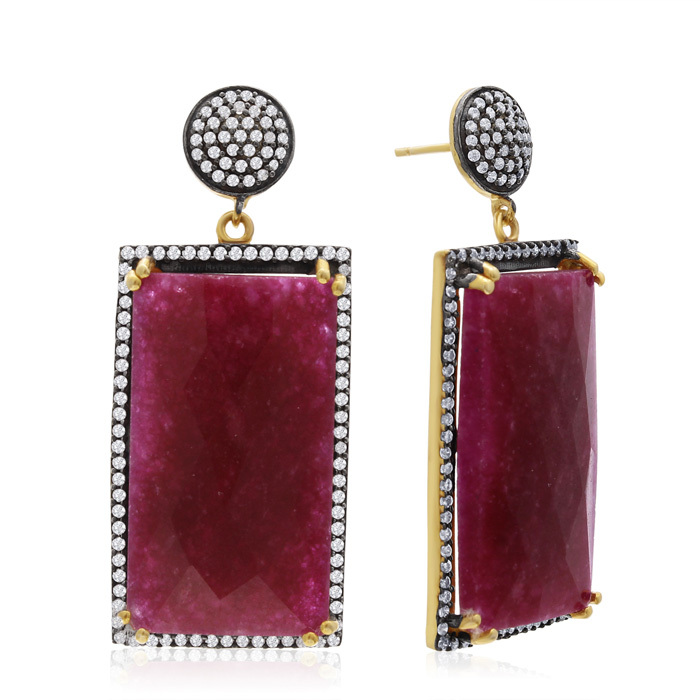 These fabulous earrings feature two diamond shape ruby gemstones. They are surrounded by sparking simulated diamond stones, as well as a disc of simulated diamond stones at the top. Earrings dangle down two inches and are about 3/4 inch wide. Earrings are in 14 karat yellow gold over sterling silver and have comfortable and secure post with friction backs. The pave disc stud portion is 10mm in diameter. 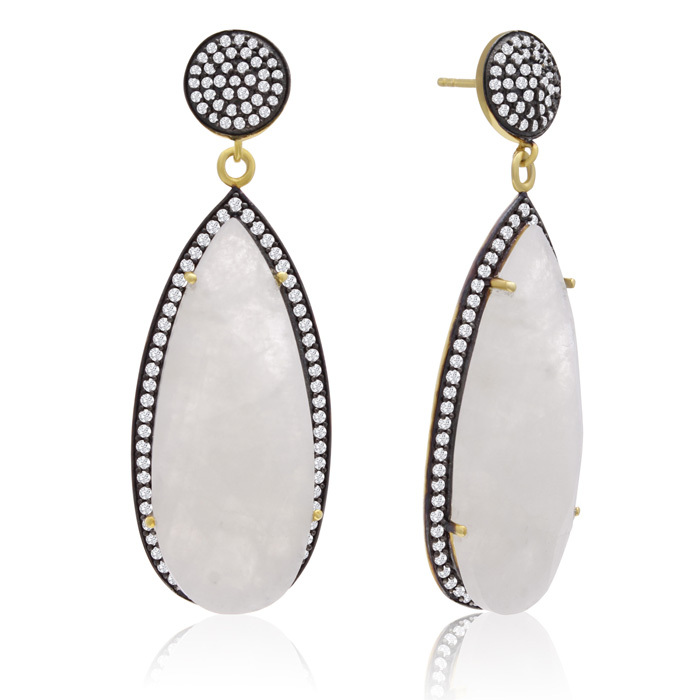 These fabulous earrings feature two free form shape moonstone gemstones. They are surrounded by sparking simulated diamond stones, as well as a disc of simulated diamond stones at the top. Earrings dangle down 1 1/2 inches and are about 1 inch wide. Earrings are in 14 karat yellow gold over sterling silver and have comfortable and secure post with friction backs. The pave disc stud portion is 10mm in diameter. 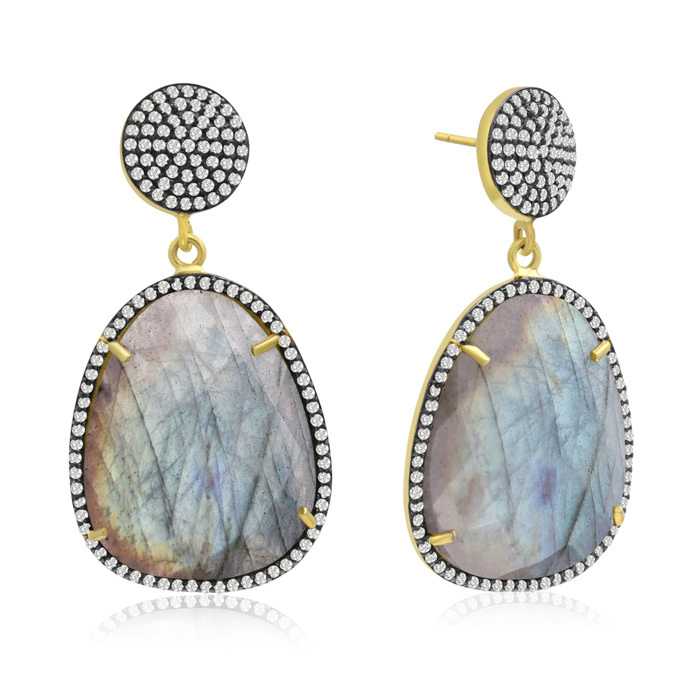 These fabulous earrings feature two free form shape labradorite gemstones. They are surrounded by sparking simulated diamond stones, as well as a disc of simulated diamond stones at the top. Earrings dangle down 1 1/2 inches and are about 1 inch wide. Earrings are in 14 karat yellow gold over sterling silver and have comfortable and secure post with friction backs. The pave disc stud portion is 10mm in diameter. 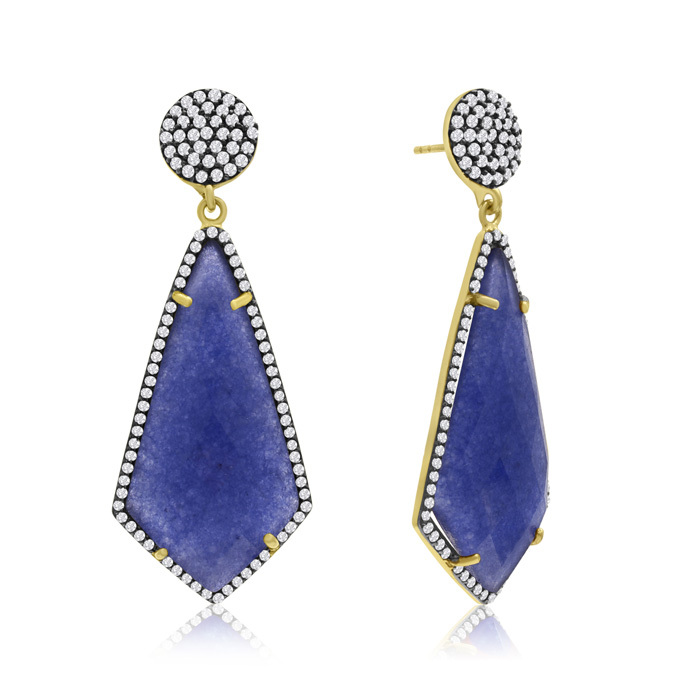 These fabulous earrings feature two diamond shape blue sapphire gemstones. They are surrounded by sparking simulated diamond stones, as well as a disc of simulated diamond stones at the top. Earrings dangle down two inches and are about 3/4 inch wide. Earrings are in 14 karat yellow gold over sterling silver and have comfortable and secure post with friction backs. The pave disc stud portion is 10mm in diameter. 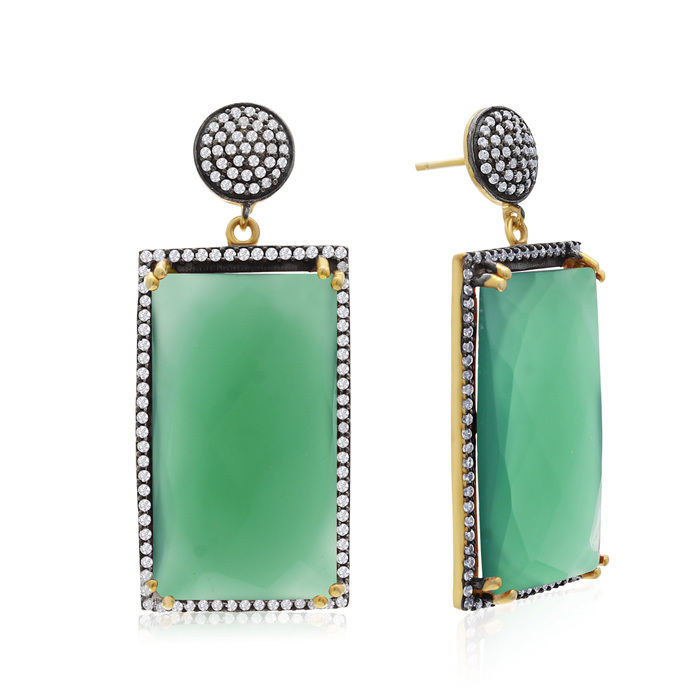 These fabulous earrings feature two diamond shape green chalcedony gemstones. They are surrounded by sparking simulated diamond stones, as well as a disc of simulated diamond stones at the top. Earrings dangle down two inches and are about 3/4 inch wide. Earrings are in 14 karat yellow gold over sterling silver and have comfortable and secure post with friction backs. The pave disc stud portion is 10mm in diameter. 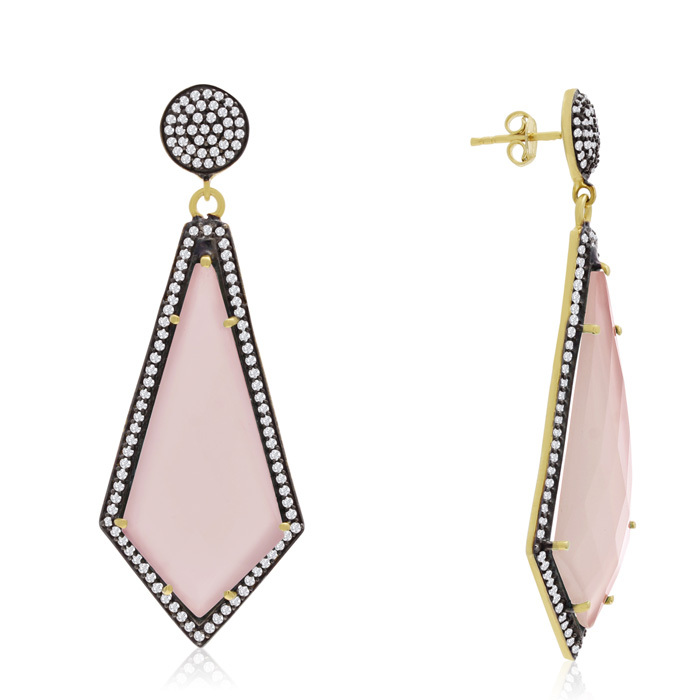 These fabulous earrings feature two diamond shape rose quartz gemstones. They are surrounded by sparking simulated diamond stones, as well as a disc of simulated diamond stones at the top. Earrings dangle down two inches and are about 3/4 inch wide. Earrings are in 14 karat yellow gold over sterling silver and have comfortable and secure post with friction backs. The pave disc stud portion is 10mm in diameter. 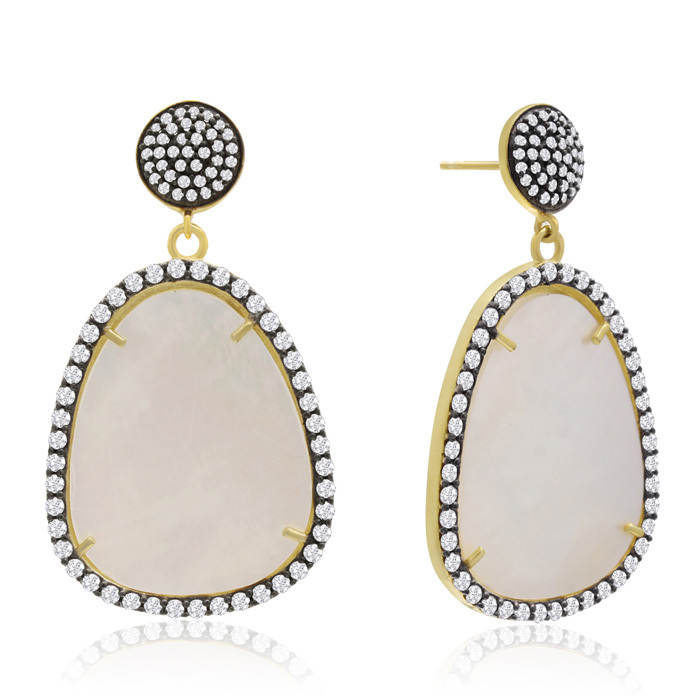 These fabulous earrings feature two free form shape mother of pearl gemstones. They are surrounded by sparking simulated diamond stones, as well as a disc of simulated diamond stones at the top. Earrings dangle down 1 1/2 inches and are about 1 inch wide. Earrings are in 14 karat yellow gold over sterling silver and have comfortable and secure post with friction backs. The pave disc stud portion is 10mm in diameter. 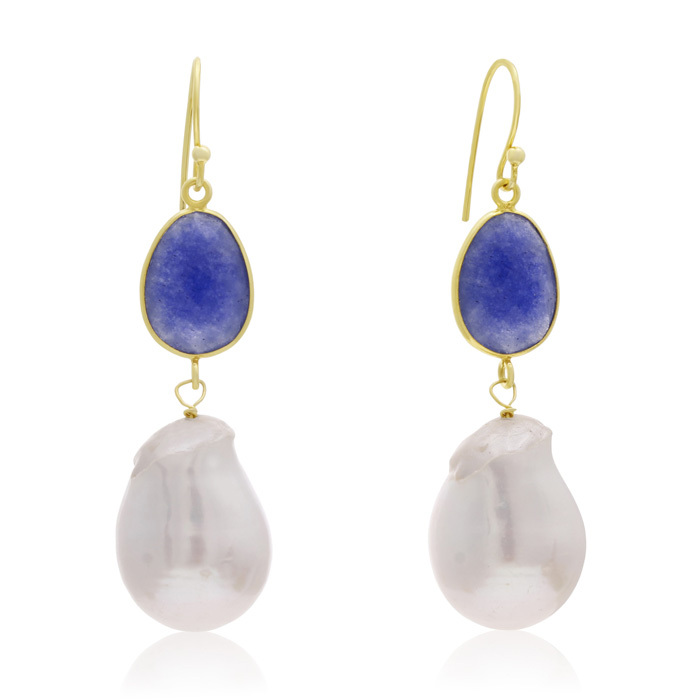 These fabulous earrings feature two free form shape blue sapphire gemstones. They are surrounded by sparking simulated diamond stones, as well as a disc of simulated diamond stones at the top. Earrings dangle down 1 1/2 inches and are about 1 inch wide. Earrings are in 14 karat yellow gold over sterling silver and have comfortable and secure post with friction backs. The pave disc stud portion is 10mm in diameter. 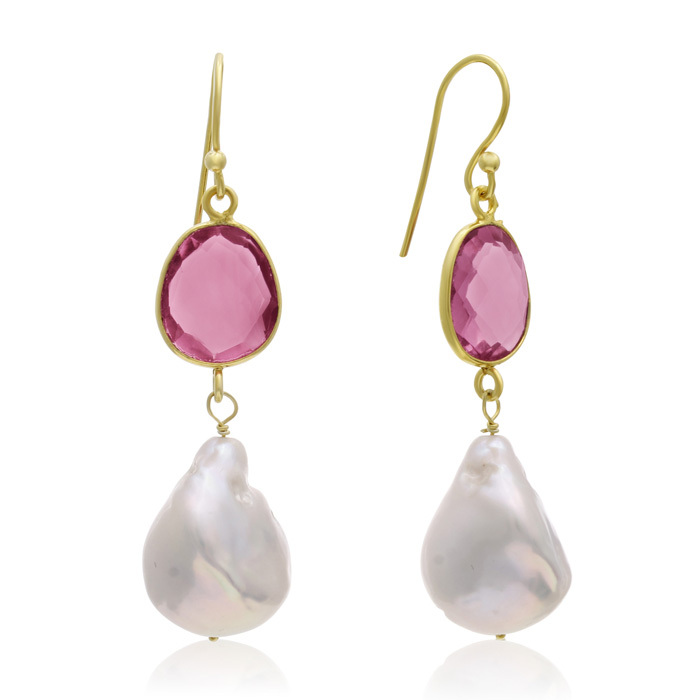 These fabulous earrings feature two free form shape ruby gemstones. They are surrounded by sparking simulated diamond stones, as well as a disc of simulated diamond stones at the top. Earrings dangle down 1 1/2 inches and are about 1 inch wide. Earrings are in 14 karat yellow gold over sterling silver and have comfortable and secure post with friction backs. The pave disc stud portion is 10mm in diameter. 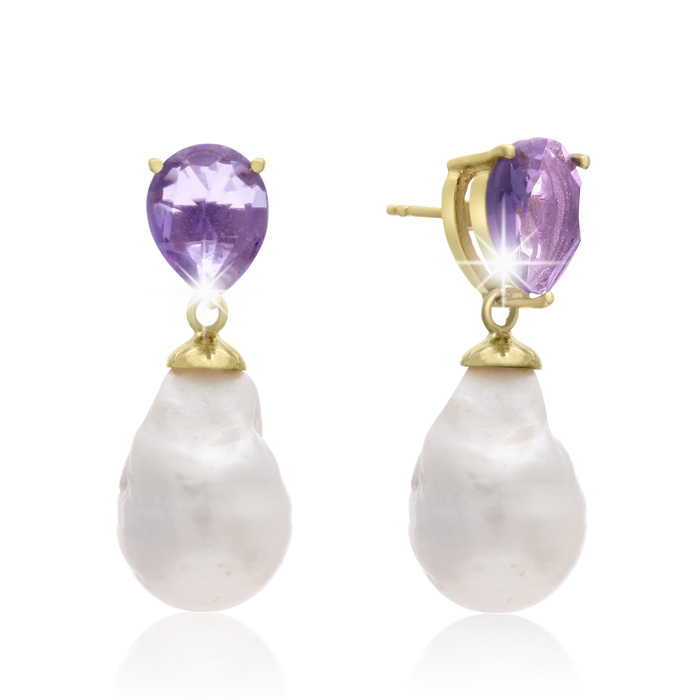 These fabulous earrings feature two pear shape amethyst gemstones. 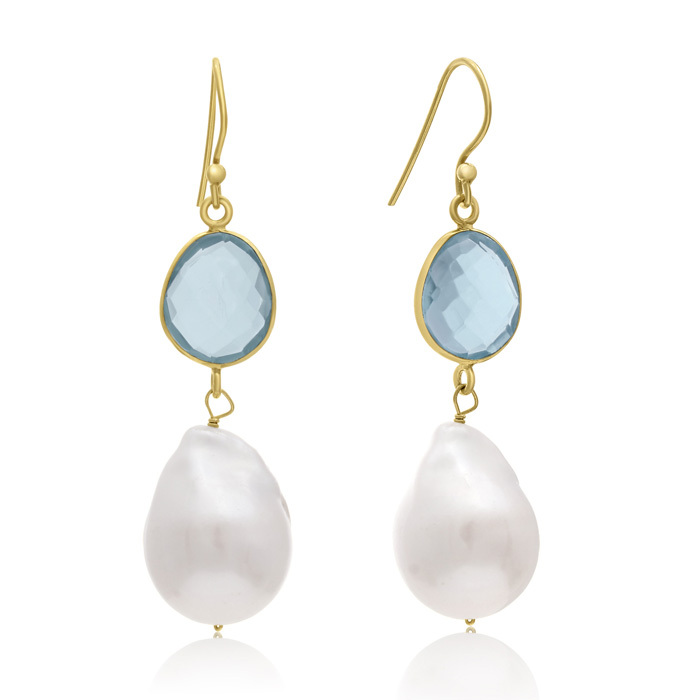 Each gemstone has a large baroque pearl at the bottom. Earrings dangle down 1 1/2 inches and are about 13mm wide. Earrings are in 14 karat yellow gold over sterling silver and have comfortable and secure post with friction backs. 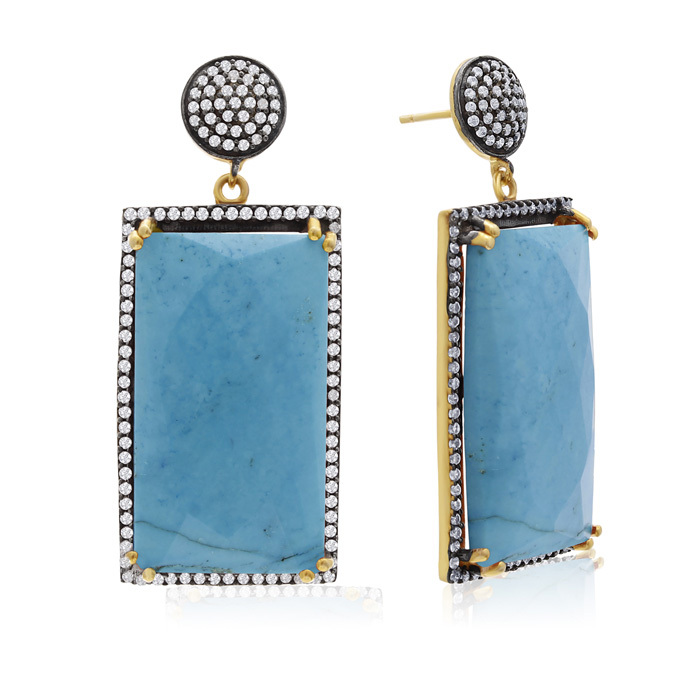 These fabulous earrings feature two blue topaz quartz gemstones. Each gemstone has a large baroque pearl at the bottom. Earrings dangle down 1 inch and are about 13mm wide. Earrings are in 14 karat yellow gold over sterling silver and have comfortable and secure fishhook backs. 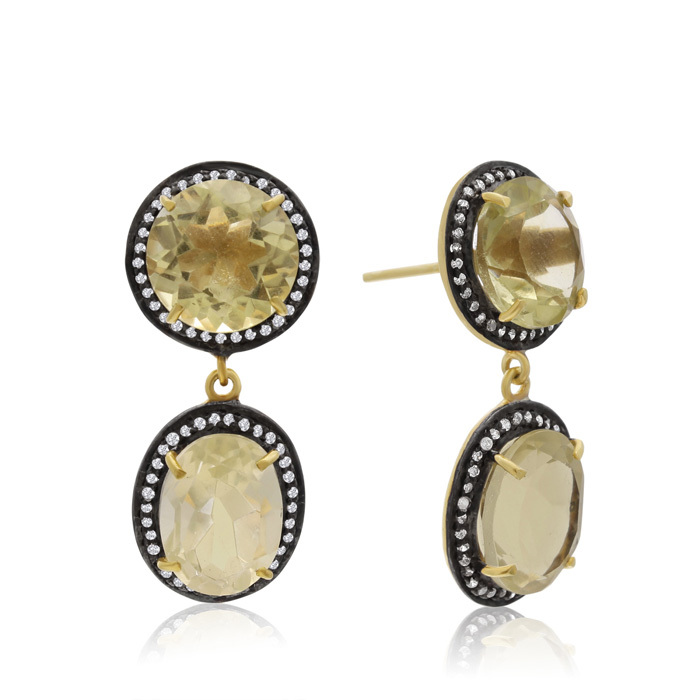 These fabulous earrings feature four lemon topaz gemstones. They are surrounded by sparking simulated diamond stones. Earrings dangle down about 1 1/2 inches and are about 1/2 inch wide. Earrings are in 14 karat yellow gold over sterling silver and have comfortable and secure post with friction backs. 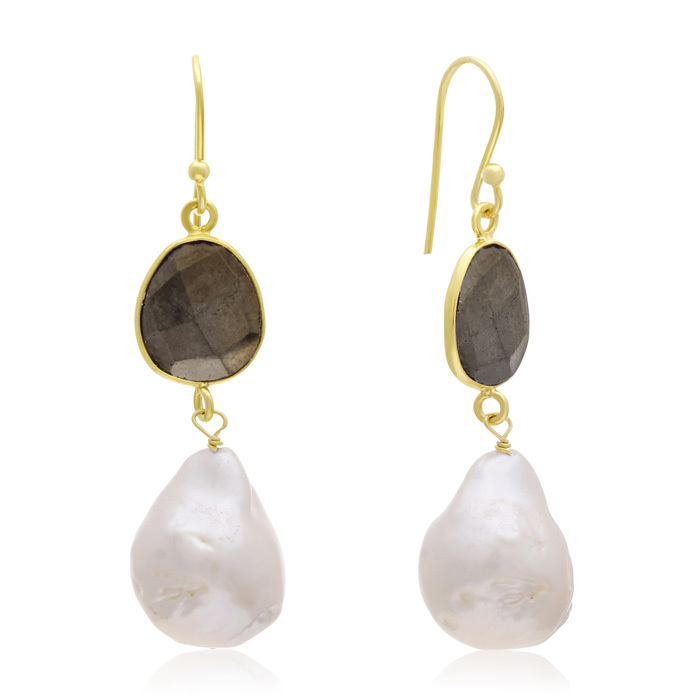 These fabulous earrings feature two pyrite gemstones. Each gemstone has a large baroque pearl at the bottom. Earrings dangle down 1 inch and are about 13mm wide. Earrings are in 14 karat yellow gold over sterling silver and have comfortable and secure fishhook backs. 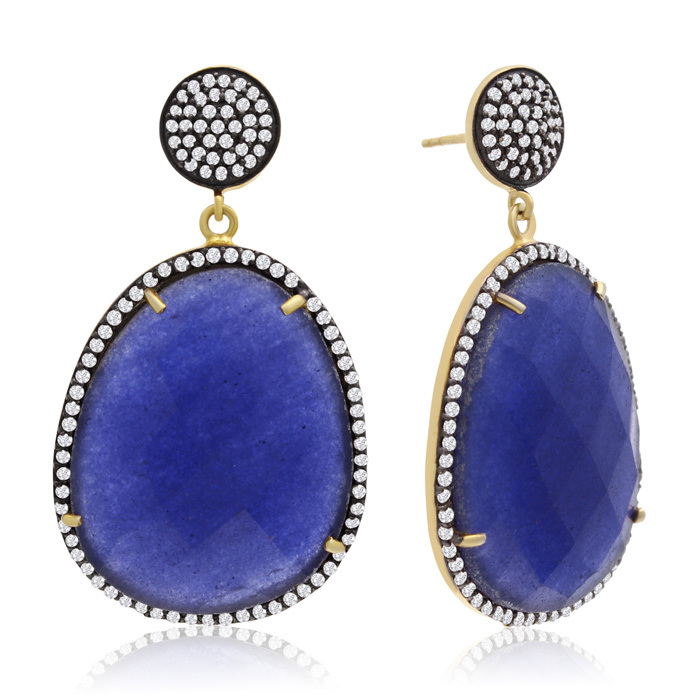 These fabulous earrings feature two sapphire gemstones. Each gemstone has a large baroque pearl at the bottom. Earrings dangle down 1 inch and are about 13mm wide. Earrings are in 14 karat yellow gold over sterling silver and have comfortable and secure fishhook backs. 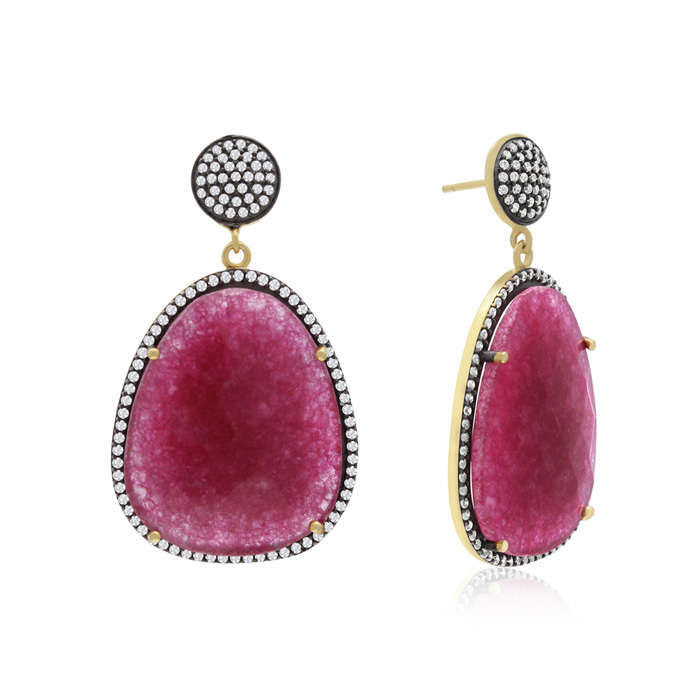 These fabulous earrings feature two raspberry quartz gemstones. Each gemstone has a large baroque pearl at the bottom. Earrings dangle down 1 inch and are about 13mm wide. Earrings are in 14 karat yellow gold over sterling silver and have comfortable and secure fishhook backs. 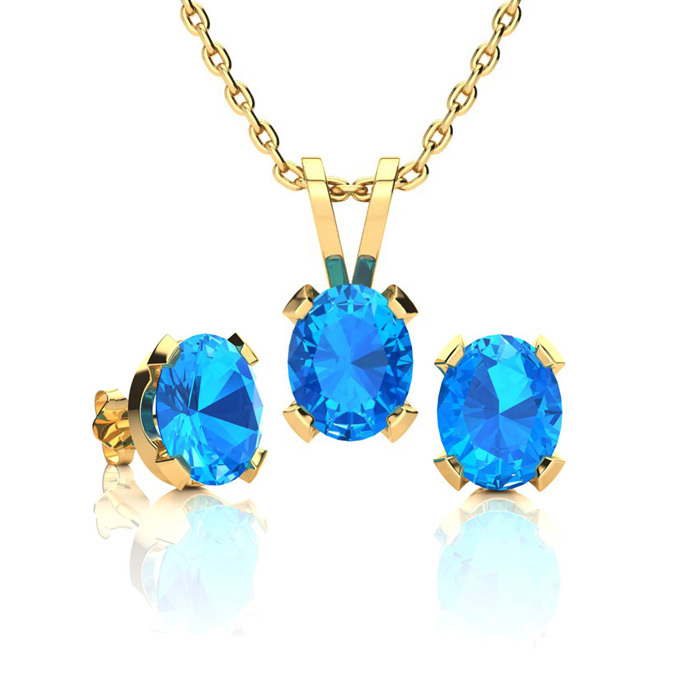 This classic gemstone necklace and earring set features three 6x4mm oval shape blue topaz gemstones. Each stone measures approximately 0.55 carats for a total approximate weight of 1.65 carats. This set is in 14 karat yellow gold over sterling silver and the earrings have comfortable and secure post with friction backs. This set includes an 18 inch cable chain with a spring ring clasp.